As part of this month's theme of winter travel accessories for your feet, let's next take a look at aluminum crampons. They have some significant advantages over their steel counterparts, though also have some significant drawbacks. Aluminum's biggest advantage over steel is weight. Most aluminum crampons hover somewhere between 18-24 ounces per pair, while most steel models easily tip the scales at 2 pounds or more. And while 8-14+ ounces may not seem like much, keep in mind that, when it comes to effort, a pound on your feet is equivalent to 5-10 pounds on your back. Aluminum crampons feature points equivalent in length to their steel brethren, both of which are significantly longer than the Kahtoola Microspikes and KTS crampons I profiled in my November 14 post. This allows better traction and grip in a wider range of conditions, especially when traveling over steep, hard-packed snow. 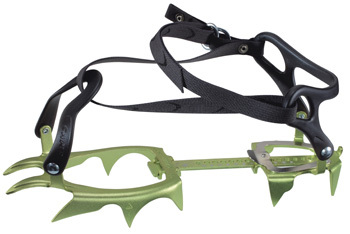 Many aluminum crampons also feature a flexible connector bar. This makes them compatible with a wide range of flexible footwear, rather than the stiff-soled footwear required for most steel styles. The drawbacks, on the other hand, come down to a single fact: Aluminum is a much softer metal than steel, which means that aluminum crampon points will rapidly become dull with use, especially if you're traveling over rocky terrain. This makes them a dicier proposition on ice where the dull points will have a hard time providing traction. You can forget about using them for any type of serious front-pointing or ice climbing. So the upshot is this. Consider a pair if you are looking for a pair of crampons for occasional use on a winter hike, or are headed out for a long, multi-day winter trip where weight is an issue. Though for this application, I personally lean towards the Kahtoola KTS steel crampons, aluminum crampons do offer the advantage of longer points—a boon for travel over hard-packed snow. 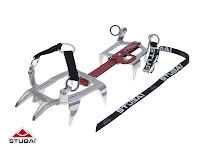 Here's a quick round-up of a few currently available aluminum crampons. All of the featured crampons below feature bindings that are compatible with a wide range of footwear , from lightweight hiking boots to full plastic mountaineering boots. C.A.M.P. USA XLC 490These 12-point crampons are the most aggressive aluminum versions I've come across. Out of the box, the points are as sharp as I've seen in aluminum. The connector bar is on the rigi d side and best worn on a pair of stiffer boots. $140; 17.3 ounces per pair. 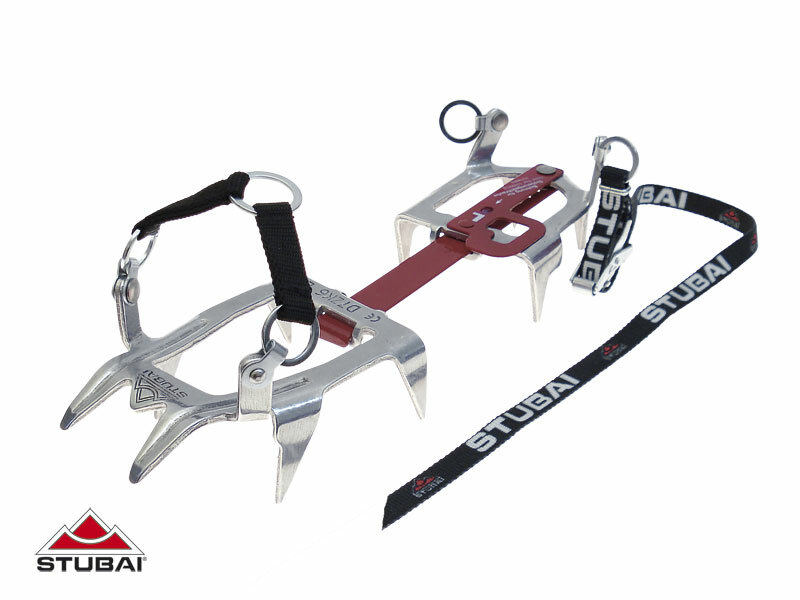 Stubai Light Classic A basic 10-point crampon with much duller points. A very flexible connector bar makes them ideal for a range of footwear. Available with four different binding systems; the Light Classic fits the widest range of footwear. $100; 19 ounces. Black Diamond Neve Strap These are basically an aluminum version of their popular Contact Strap all-purpose steel crampons, with a more flexible connector bar. $150; 21 ounces.